If you’re in Boston you just have to see a game in Fenway. I’m a Yankees fan so I have to hate the Red Sox, but even I love watching balls bounce off the green monster and appreciate the history of Fenway. They have seats up there too! 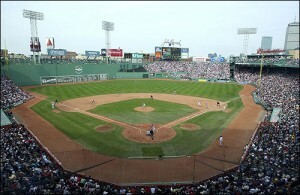 Purchase MLB tickets including all tickets to Fenway Park and Boston Red Sox tickets. Also available are Boston Bruins tickets and Celtics tickets through sports ticket broker Vivid Seats. Fenway is also distinct because it is the oldest MLB stadium in active use. Opened 5 days after the Titanic sunk, on April 20, 1912 you do ahve to be somewhat careful as there are obstructed view seats. These are sold as obstructed view so as long as you’re getting your tickets from a reputable broker you can identify which seats have the poorer views. The best seat in the house might be the lone red seat in the right field bleachers (Section 42, Row 37, Seat 21). The lone red seat is where a Ted Williams’ homerun landed, the longest measurable home run ever hit inside Fenway Park. The official measurement was 502 feet (153 m) although Hit Tracker Online estimates 520 to 535 feet. Obviously you can buy tickets for seats a little closer to the action. Fenway Park is rarely used as a concert venue but big names like Bruce Sprinsteen, Dave Matthews Band, and the Rolling Stones have performed there recently. Located and named after Boston’s Fenway district, the official address for Fenway Park is 4 Yawkey Way, Boston, Massachusetts.